One of the many delights of the Minnesota State Fair is trying all of the new foods! I was able to get a preview of some of the new foods coming to the fair this year. Every year there are some hits and some misses, but it is all a lot of fun in my book. From new foods on-a-stick to ice cream with a kick here are some of the new foods that I got to try! One of my new favorites is the Salted Caramel Puff malts and sundaes at the Dairy Goodness bar! It’s sweet, salty, and perfect for a hot day. 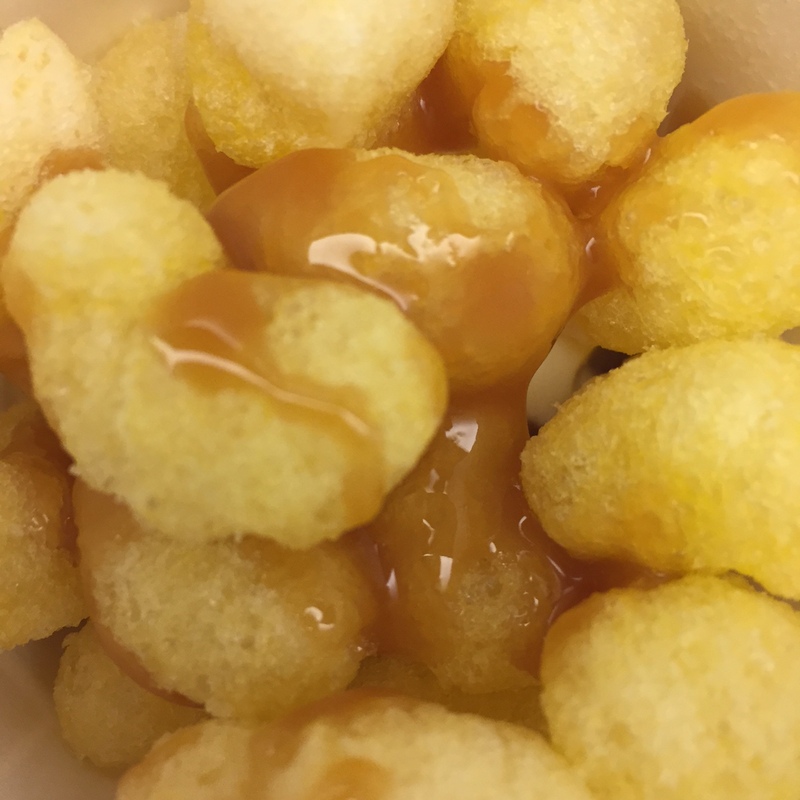 I am a huge fan of Old Dutch Puffcorn and adding the caramel and sweet ice cream to the mix made me jump for joy. Going to the Diary Goodness Bar is a tradition for many fairgoers and there’s a reason why, they have the best treats! This new flavor was chosen during the “Flavor of the Fair” contest. The contest is back this year and you’ll have a chance to submit your own flavor to become the next Flavor of the Fair next year. I’m going to enter–that’s some serious bragging rights. 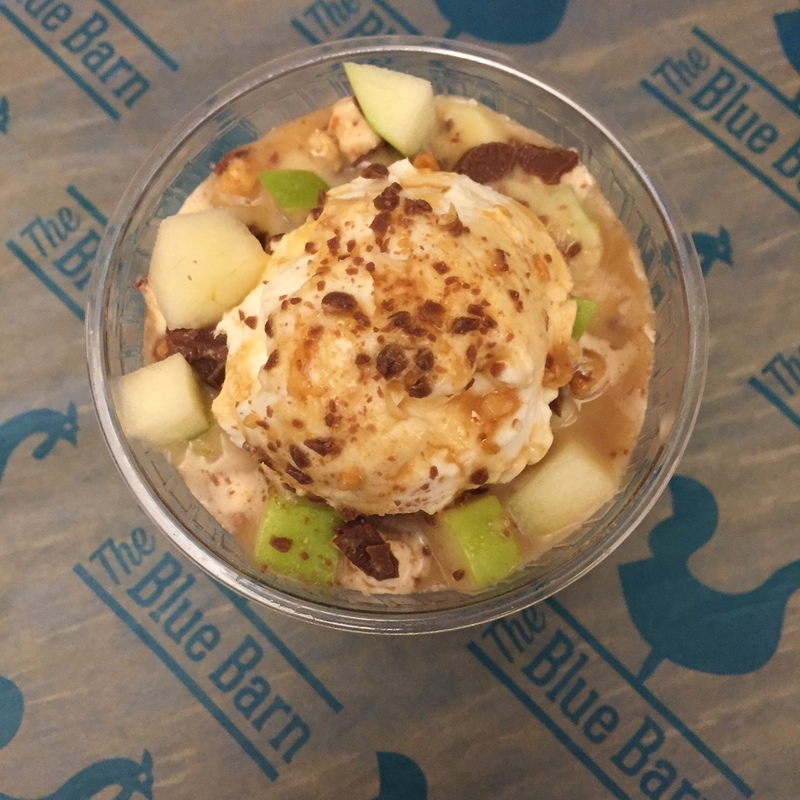 I’m also a fan of the Blue Barn that’s part of the Blue Plate Restaurant Group. They bring food at the fair to a whole out-of-this-world level. They know how to serve food to large groups of people because they have the experience of doing it every day. I was able to try their new snickers salad which was refreshing and sweet. But, I am even more excited to try Pi their apple pie flavored beer. Hopefully, I can get a glass. I have a feeling that it might be one of the most popular items at the fair this year. Some of our favorites from last year will be back and there are a few more new items on the menu. 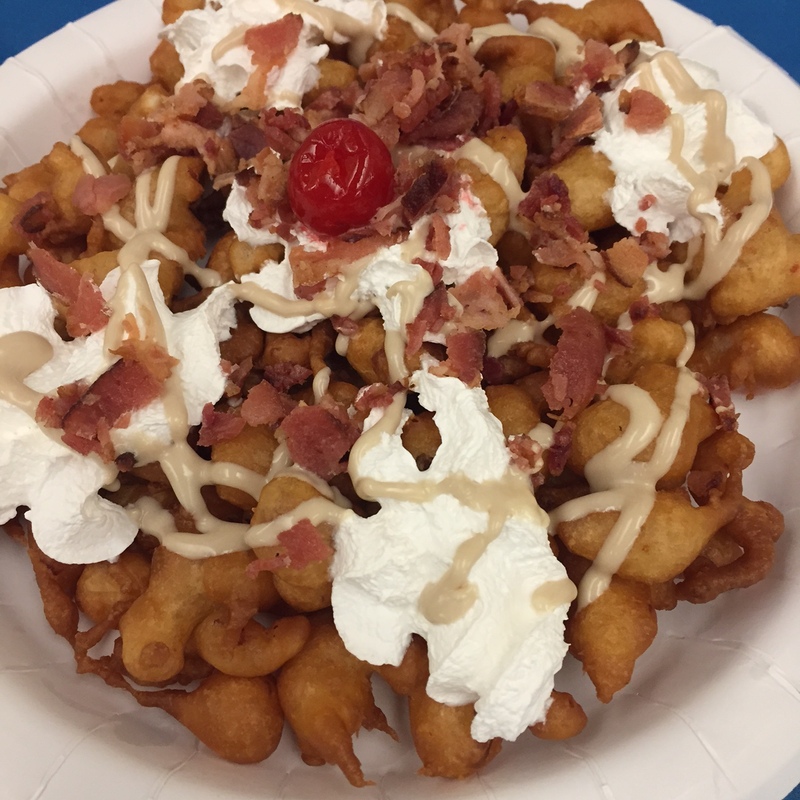 The Maple Bacon Funnel Cake from the Funnel Cake stand in the food building was also really great. We already know those flavors are complimentary, but they somehow got them to work with a funnel cake too. If you are a funnel cake fanatic you should try this one. Lulu’s Public House is my favorite place to grab a beer at the fair. They have a top deck which allows you to relax and do some people watching. I spent a lot of time here last year and I know I will be back again to enjoy it again this year. If you are working at the fair, Mancini’s has a great pizza that is not your typical fair food. After working all day you don’t want the usual deep fried foods that people typically share. Give this a try this year! Not a new food, but a great one, there’s a gyro booth by the Giant Yellow Slide that has great gyros and salads. Although, this is just a preview of some of the great new foods you’ll see at the fair I hope you are pumped to get out there and give some of them a try. because going to the fair is a tradition! What food are you most excited to try this year?